Homeschooling - Princes Off The Grid. Homeschooling, the one subject we are asked about the most! When we started informing people about our plans for the next year the first question on their lips was always, "but what about the kids, what about their education?" Clearly this was something we had thought about for many weeks and months before coming to our final decision to homeschool (worldschool) and it was naturally a big worry for us. Hopefully in this section we can share insights from some of our research into this matter and as we progress with this journey some of our own experiences with home educationg the kids. Firstly, lets settle the biggest worry for anybody that might be contemplating doing the same thing as us and homeschooling, but are held back by the huge obstacle of educational worry. You do not have to be a qualified teacher of any sort to teach your kids, do not let that stop you making a decision of a lifetime. Just sitting one on one with them, helping them read and write, spell, add or subtract numbers for just 1-2 hours a day is ample! You will see an exponential growth in their learning curve and huge growth in personal confidence, this will push them further than they would ever have known when lost in a sea of 30 pupils, not understanding something and being afraid to ask a question. Face it, we have all been that kid. Through researching this topic we have managed to find some online educational tools that are truly amazing and service the growing homeschool or worldschool communities. The absolute best site without a doubt is the Khan academy. If you are yet to learn of this website, before you check it out, please watch the TED talk by the sites founder Salman Khan, affectionately known to Kaitlyn and Dan as 'Uncle Sal'. Thanks Uncle Sal, you have helped us so much already, you are truly an inspirational, selfless and caring person. Probably our biggest influencer in making the leap of faith regarding education is Sir Ken Robinson. He was the UK Director of The Arts in Schools Project (1985–89), Professor of Arts Education at the University of Warwick (1989–2001), and was knighted in 2003 for services to education. With this in mind we kind of thought he was probably worth listening to when it came to his insights on education policies today. Sir Kens TED talk is the most ever watched talk in TEDS history, with over 23.5 million views to date, it's understandable really, take a look at the presentation for yourself, you will certainly relate to some of the issues he addresses here. Please note that we didn't just stop there with the research, we managed to find more individual views and experiences, in fact we managed to find the view of a teenage boy who has been practicing homeschooling since his parents pulled him out of school at the age of 9 (after watching Sir Kens Talk). In this video he shares with us what he is experiencing right now and how it is shaping his life. Now, any 13 year old kid who is brave enough to get up in front of an adult TED crowd and deliver an 11 minute speech, in our minds, is worth paying respect and attention to. Needless to say we were pretty damn impressed! Oh, and our girls think this dude is pretty damn inspiring too! As we carry on this path of discovery, we are slowly learning about more and more websites that can offer online education. One of the latest discoveries (via investor Tim Ferriss) is the startup company www.Noredink.com who address the subject of learning English and correct grammar in a holistic and inspiring way. You can watch (a nervous) founder and CEO Jeff Scheur present the websites functionality, then answer questions below. For those of you interested in keeping up with the progress we make whilst homeschooling we will endeavour to update this section of the website as often as possible. On the flip side, please contact us if you know of any great sites that we can also benefit from! Today was Songkran here in Thailand, so naturally this was todays topic of learning, for all of us! Follow the link to download one of Kaitlyns Power point presentations and learn about the Songkran Festival too. We have been travelling now for 2 years since originally writing this tab in the blog, which seems to have whizzed by! Of course, the heaviest baggage that we carry around with us from port to port is the worry of our kids education. No matter what we tell ourselves, or how much we have seen the kids engaged in their surroundings, having fun and learning at the same time, the nagging doubt over this subject and of social pressure/compliance or whatever you want to label it, is a constant drag on our parental subconscious. We have to constantly remind ourselves of the reasons that compelled us to take this trip in the first place, but sometimes the reasons are offered up on a platter! For example, whilst sitting in on a rainy day in Switzerland helping Sophia with some English problems, we came across this little gem in the English activity book that we had kept from her school to travel with. Laughable at best, disgraceful of course, but pause and think about this. Think about how she would have HAD to have filled in this blank, with something, anything, because leaving it blank (which of course would have been the right thing to do) would have resulted in the dreaded red cross, crippling her confidence and self motivation. It's 'anti teaching' and this is not, as many would jump to conclude, confined to a particular subject or country. Recently we found another great TED talk from Dan Meyer, a young Mathematics teacher who is battling the text books, he is trying to unwind, unravel, even reverse the way Maths (ok, ok....Math for you Americans) is taught in the US. Note, this talk is already 6 years old, let's ALL hope he has had some success and is incrementally changing the system. I wish this guy was around when we were learning Math(s). Watch the talk, and be sure to make a note of his blog, twitter and email address. 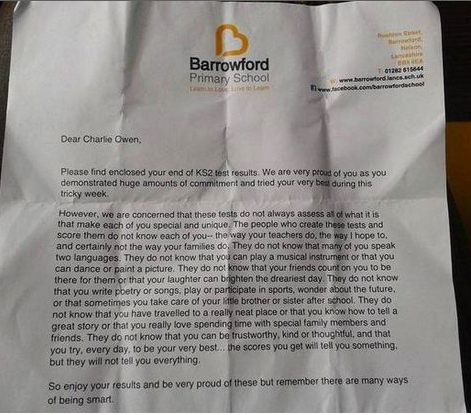 You may or may not have seen in the news lately the letter a primary teacher wrote to her students. Truly heart warming and highlights a transition that formal education needs to take, and fast! Another huge inspiration when it comes to anything it seems is Seth Godin. Below you can watch his TED talk about education which he delivered in 2012 to an audience of teachers! Prince Ea is currently taking the interwebs by storm with his amazing insightful views on the world at large. He covers many topics and presents his work in such a way that truly appeals to the younger audience, the key audience, the generation that will make the difference in where this world needs to be. In the videos below he talks about learning and how anyone can achieve anything and how the school system needs a huge overhaul.